I wonder what the world would be like if everyone should express similar beliefs and diets. For some people the sight of a coconut brings to mind rum, vacation, freedom, lazy days, flip-flops, straw hats, a stress free lifestyle and floral clothing. Life in the tropics was always touted as being conducive to good health, thanks to the coconut which most people have identified with. Ask the elders of yesteryear and they would have told you that coconut water is a great thirst quencher and the only water that goes straight to the heart. Equally soothing to the soul is the signature picture of the tropics, an ocean with blue water and a single coconut tree standing guard. 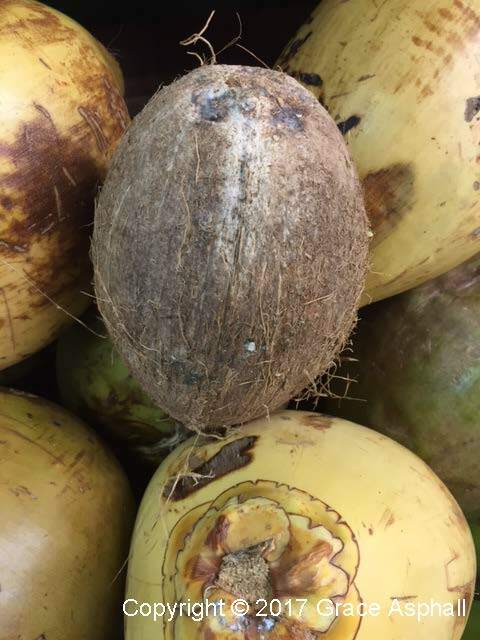 Chiefly though, like a true agriculturalist, it is noteworthy to mention that the coconut tree is a member of the palm family and is significant to the tropical and subtropical climates. 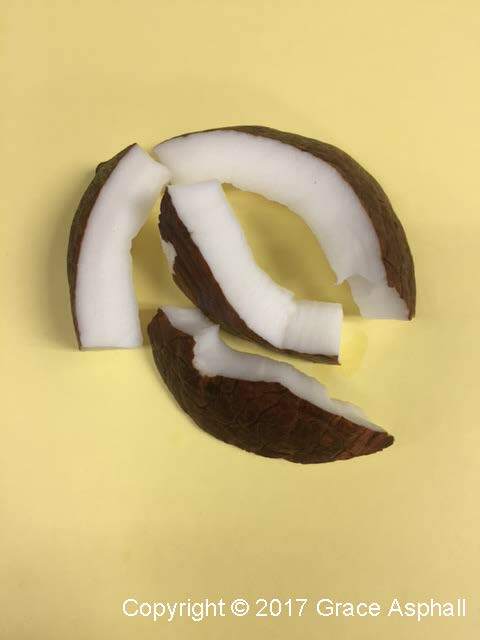 Genus, endosperm, copra, drupe, mesocarp, pericarp, epicarp and endocarp are some of the endorsed labels that are associated with the anatomy of the coconut. The translations are welcome and when put into proper perspective they give credence to the perverse minds of humans. If the translations are not clear, view the handling of a coconut by a consumer. Nature makes no apology in it delivery as the skin is peeled away, exposing the waiting flesh in the middle ready to be eaten. Besides courting the freak in humans, the coconut is also known for its resourcefulness. In its immature stage it is referred to as “jelly coconut” because of its tender meat or flesh and abundance of water. The meat of the matured coconut is hard; from which oil and milk can be derived. The shell is used as charcoal or carved into jewelry and other items; whereas the coir from the fibrous husk is used as stuffing for mattresses. With all those assets and more, the coconut essentially equates to wholeness. As a child I was frightened by the height of the coconut tree and the tales that surrounded it. The most interesting tale was about its association to the supernatural world. For example, pieces of meat from the matured coconut were placed in designated areas in and around the home to trap evil spirits or to be more cultural “run di duppy dem”. I also recall the coconut being used as a weapon. It functions like the stone. One forceful strike on any area of a person’s body, especially the forehead, could be ruinous. Then there were times when the physique of the coconut tree was used to verbally abuse a lanky person, “Goh wey! Yuh lang like coconut tree”. The most astonishing display of the verbal abuse was when the abuser included the owner of the coconut tree to bestow the abuse, “Goh wey! Yuh lang like Mass Jim coconut tree”. Some songsters also used the coconut to convey sexual advances and thirst. Digging into my memory bank one such song carried the lyric, “Coconut wata good fi yuh dawta”. If that wasn’t enough just listen to a Jamaican who detests when someone lies to them, “Yuh going straight tuh hell in a coconut shell”. It’s hard not to look at the fact that a dried coconut shell vigorously fuels fire. The most admired recollection of the coconut is the entrepreneurial spirit it had brought among the people who were financially challenged. They were propelled into making cooking oil from the meat of the matured coconut for home use and peddling. At the time, the popular brand Puritan or other refined oils would have left them broke if they were to cook with them every day. Additionally, the coconut oil that they made was also used for skin care and medicinal purposes. Their resilience and skill also led them to produce milk from the coconut which they used in teas, coffee, soups, porridge and other foods. 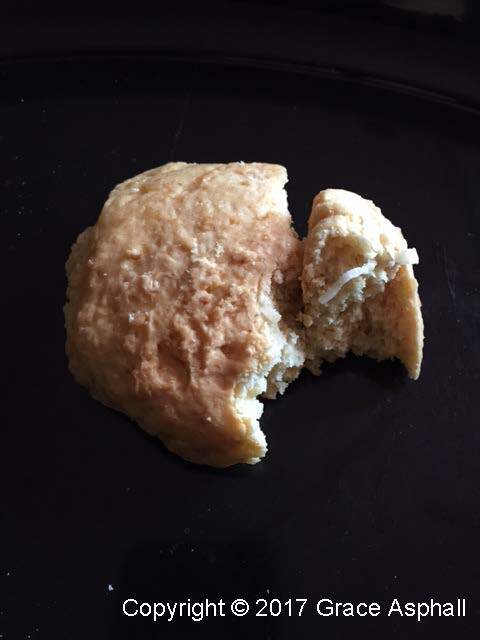 The phrase “tough cookie” is relevant to the coconut. It is by name, fame and nature. It rose from the scrutiny of the rich who had viewed it as a poor man’s food, back in the day, to being one of the most sought after produce. 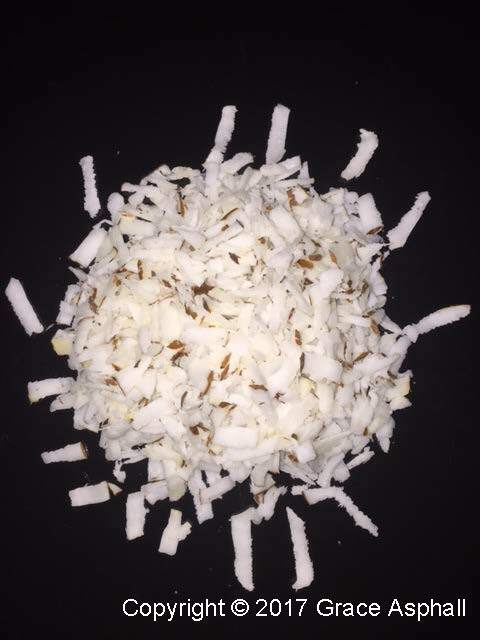 More and more each day the ultra-nutritional benefits of the coconut have been alarming according to reports and research, enough to drive its lovers nuts. It has become a popular and main ingredient in most concoctions produced in the kitchen. I think of the delectable indulgences especially the Jamaican ones such as cassava, potato and corn puddings, toto, grater-cake, drops and the roast coconut which was one of my favorite childhood treats. Today, the toto is a big winner for me from among the list of coconut products. It has become a handy snack at home and work. It would be an evil act in the culinary world not to add coconut as one of the ingredients when making TOTO. However, my one desire is not to have any one shred their coconut in my toto. The toto is not a participant in a ticker tape parade. The confetti look alike pieces of coconut dodge my bites all the time. It is impossible to chew the slender suckers without biting my tongue. I spend too much energy focusing on how to get rid of them instead of enjoying the real taste of coconut in my toto. While I am at the heart of the shredding of coconut in my toto, I have also noticed the coconut drizzle in its various debut. What’s up with that? Please stop with the coconut drizzle. Sometimes it drizzles so much that it floods away the taste of the other ingredients in the food. I know that I am not the only being around but it’s important to remain calm in the kitchen and not be carried away by creative juices. My toto is not a “cook-off” game. Be nice to me. Let me enjoy a chunky piece of coconut in my toto. Let me get a good bite of it, chew and then swallow. That is all I desire and when all my teeth are gone due to aging I will have grated coconut in my toto, soft and poh-toh poh-toh (slushy). Tah-tah! The things that have been overlooked could be important.